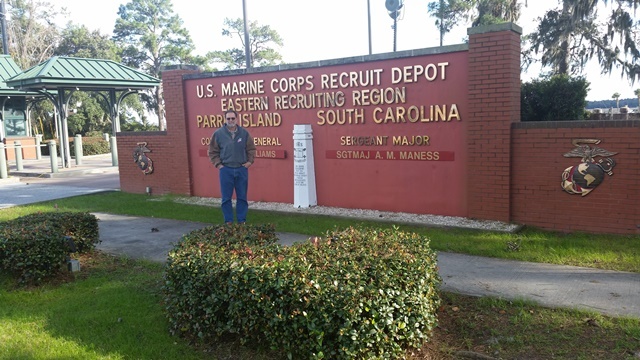 One of the high points of our trip to South Carolina earlier this month was a visit to Parris Island. Forty-seven years ago my husband, Dean, underwent U.S. Marine Corps basic training there. We spent hours taking in the exhibits in the museum, especially the ones pertaining the Vietnam War era, during which Dean served. I got a glimpse into a time period of my husband’s life that helped to mold him into the man he is today. 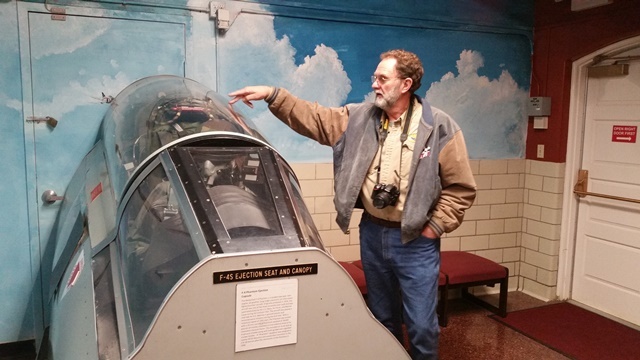 One exhibit especially was meaningful—the ejection seat and canopy of an F-4 Phantom, the jet Dean worked on as an aircraft electrician. Dean explains how the canopy and ejection seat worked. 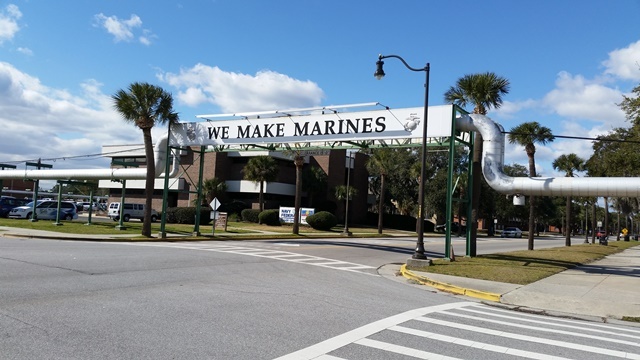 I love this banner over an intersection on the base. There are three Core Values: Honor, Courage, and Commitment. 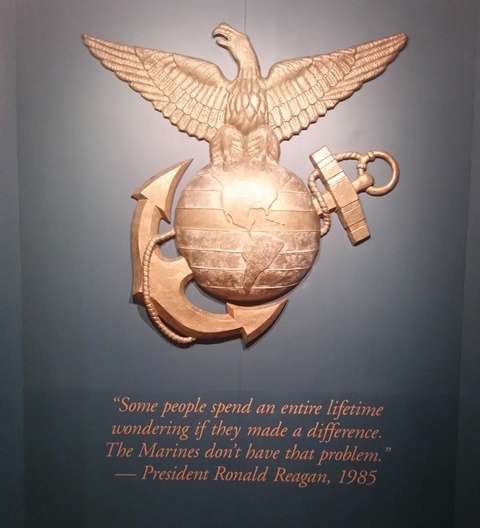 Add to that the Marine Corps motto, Semper Fi (Semper Fidelis), meaning “always faithful, always loyal,” being true (devoted) to God, family, friends, duty, country. 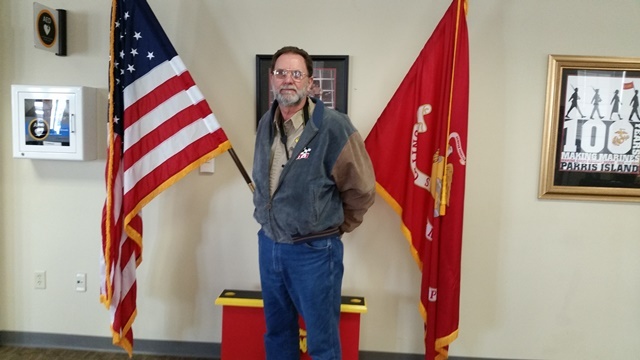 Dean reflects on his experience as a U. S. Marine. Honor, courage, commitment, faithfulness, loyalty—traits God, too, wants us to consciously develop in our character and in our children (see Deuteronomy 11:18–20). These traits guide us, provide a foundation for right living, and make us better people. We admire them in our heroes. They are qualities we should look for in the candidates as we go to the polls. Just think: What would our community be like if everyone adhered to these Core Values? Our society? Our country? Our world? Neither should the child of God. Father, help me to work with You as You develop these qualities in me. May I be a living example of a true Christian. Amen. To view a few more pictures of our trip (I plan to add more), click here. Beginning with the Spring 2016 newsletter, I’ll be giving away a $15 Amazon gift card to one newsletter subscriber, whose name will be announced in the newsletter. In addition, I’ll be offering exclusive material and occasional giveaways to subscribers only. Have you subscribed yet? If not, you can sign up for the newsletter by clicking HERE. “I’m in way over my head,” I told my husband when I phoned him to let him know what time I’d be home. I’d signed up for a Pysanky egg decorating workshop, knowing full well the extent of my artistic abilities is drawing stick figures and happy faces—in pencil on paper. So why was I sitting at a table with a burning candle in front of me, a soot-blackened kiska in my hand, trying to draw a flower with wax on an egg? That it would be fun? No. I know too well the frustration and misery of trying to do something I am totally inept at doing. For the social aspect? Nah . . . homebody that I am, I’d rather have been at home reading, working on a jigsaw puzzle, taking my turn in my electronic Scrabble games, or watching NCIS reruns. For the challenge? Nope. I can think of more satisfying challenges to take on. Perhaps it was the little Slovak girl in me—my roots calling to me to learn something about my heritage. Pysanka, you see, is an egg decorated using wax to draw intricate motifs and designs on the shell at various dyeing stages. The art form dates back to early Slavic cultures. To me dyeing Easter eggs meant plopping hard-boiled eggs into a glass of dye mixture. With the kit came wax pencils, but the most I ever did with that was scribble my name. And even that looked pathetic. Best just to dye the eggs. Now in my sixties, I’m finding more and more meaning in my heritage. (Remember the Thanksgiving Day Cemetery Run?) So I signed up. And showed up. And almost gave up. But help came from many sources—the workshop leader, who gave me ideas for designs at each stage, told me what to do for the next phase, and didn’t laugh at my flower; the two ladies at my table, who patiently showed me how to use the kiska (wax pen) and reassured me my egg would turn out fine; and the more experienced ladies whose intricate designs, rather than intimidate me, awed me and inspired me. In life, too, we occasionally find ourselves in situations over our heads. Sometimes it’s by our own doing; sometimes it comes under the “life happens” category. How do you respond? What did Peter do when he found himself in over his head? He cried out for help: “Lord, save me!” And immediately Jesus reached out and caught him (Matthew 14:30–31). We, too, have the same source of help that Peter had, but too often we’re too proud to ask. It’s no shame to ask for help—whether from God or from others. Indeed, our heavenly Father puts folks in our lives who can help, if we only ask. My Pysanka won’t elicit any oohs and ahs, but, with the help of others, I finished it. Why, I’m even thinking of designs for next year’s egg. Thank you, Father, for sending me help—even when I don’t ask for it. Amen. This is my Pysanka. 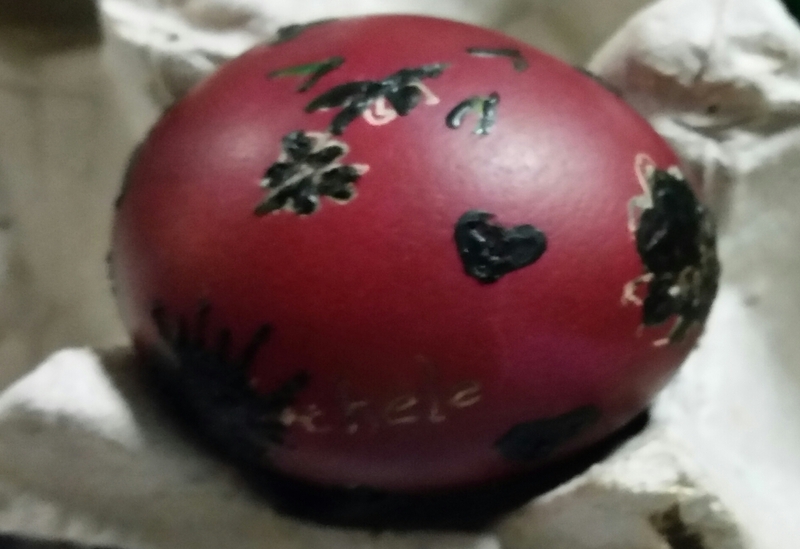 Although I’m done decorating it and the dyeing stages are completed, the wax (black) will be melted off, the inside of the egg suctioned out, and a coat (or two) of varnish applied. 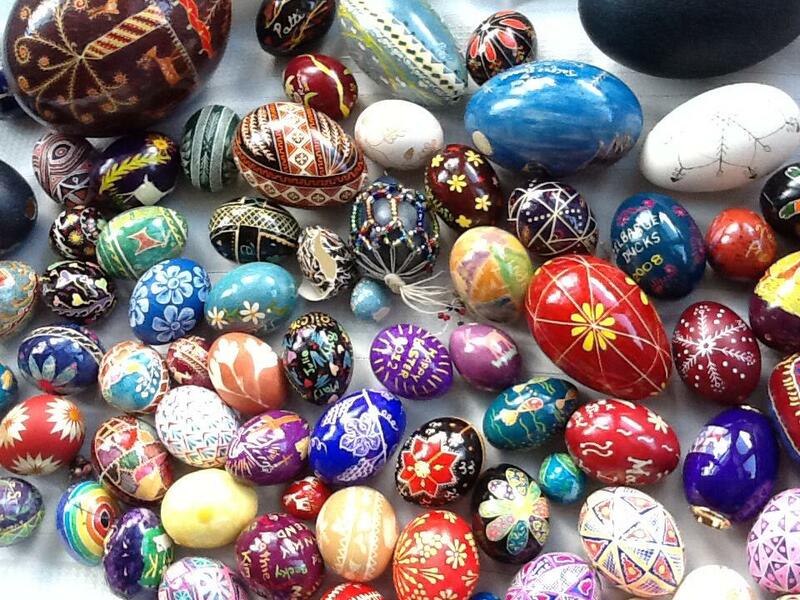 Workshop leader (and Pysanky expert) Jeanne Curtis will complete these final phases. 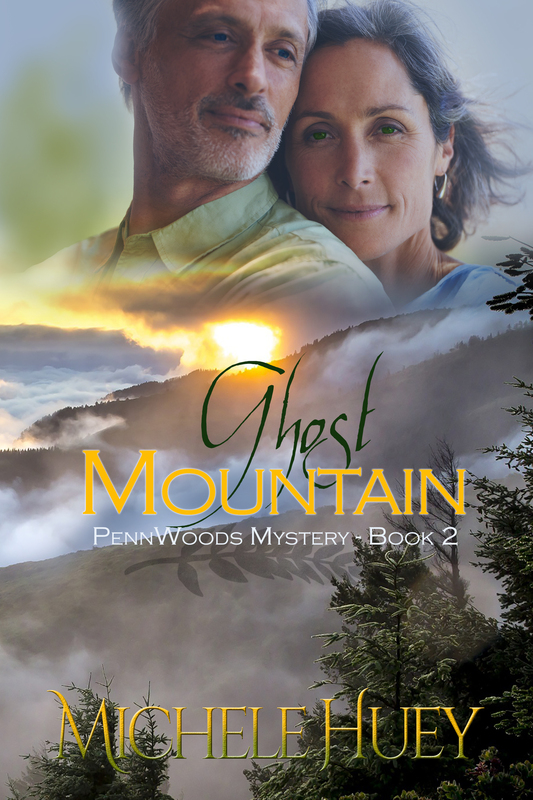 Murder, money, and mayhem—just the formula for romance. Romance writer Melody Harmon’s writing career is on the skids. 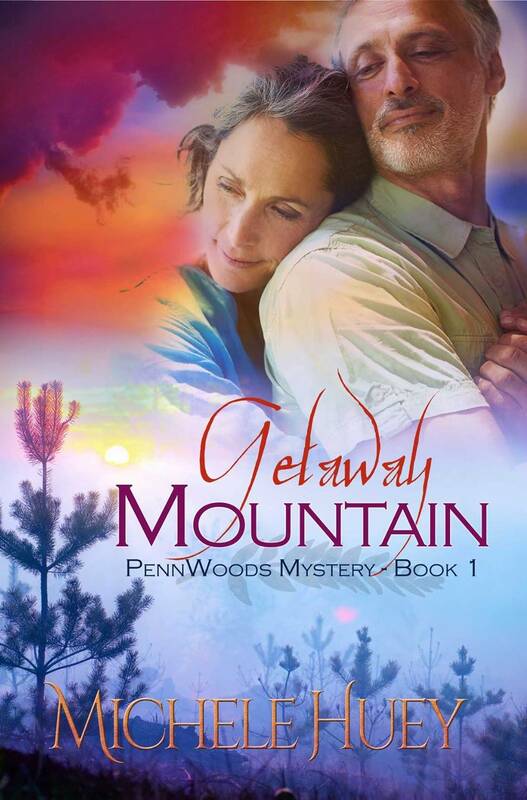 Ex-cop-turned-suspense-writer Don Bridges isn’t doing much better. Then they team up and the story begins. Available on AMAZON in Kindle ($2.99) and paperback ($13.49) formats. Click here to order from Amazon.